Use 2 SIMs in 1 Galaxy S8 PLUS with a MAGICSIM Dual SIM adapter. Want to use 2 SIMs in 1 Samsung Galaxy S8 PLUS? Now you can, with a MAGICSIM ELITE Dual SIM adapter. MAGICSIM is the perfect solution for business people, travellers, commuters, or anyone who uses more than one SIM card or phone number. The MAGICSIM Dual SIM adapter lets you switch between your SIM cards in two easy clicks using your phone's existing menu. That means no more lengthy SIM swaps, no more international roaming, no more hassle. MAGICSIM ELITE is the most advanced adapter on the market, specifically designed for the latest smartphones. 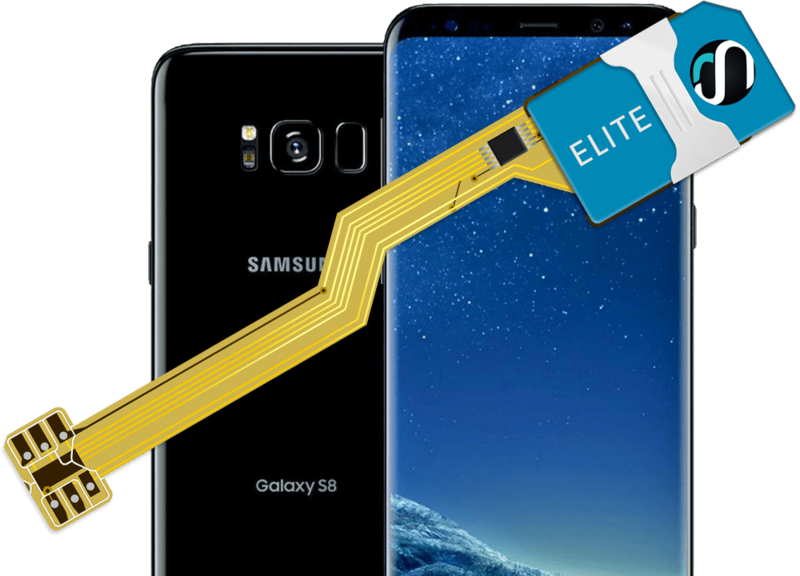 The ultra-slim chip is optimized using the newest Dual SIM technology, offering enhanced performance, quicker switching, and greater compatibility than previous models. It is fully compatible with all the latest firmware versions. Just plug and play!